The Blackberry is an aggregate fruit, containing many small dark purple colored drupes with soft fragile skin. There is a greenish white core in the middle of the cluster. Immature red and hard blackberries convert into mature black and shiny juicy fruit. Blackberries can be consumed fresh, frozen or canned. The glycemic index of blackberry is 25 which falls under low GI category and the glycemic load of ½ cup of blackberries is 2.02. Anthocyanins are found in blackberries which is responsible for the rich color of the tiny fruit. Since it is extremely rich in antioxidant activity because of the phytonutrients present within it, blackberries are also beneficial in aging, keeps your skin glowing and improves your cognitive function. Is blackberry safe for diabetics? The glycemic load of ½ cup of blackberries is just 2.02 which makes this tiny dark colored fruit an ideal option for diabetics. Since blackberries are very low in carbohydrates, the blood sugar levels are managed pretty well and there is no spike in the glucose levels instantly. 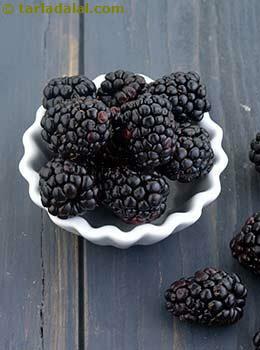 Fiber (4.2 g in ½ cup) present in blackberries absorbs nutrients gradually and slowly releases into the bloodstream. Thus will not let your blood sugars spike up instantly. The antioxidant rich blackberries reduces the risk of cardiovascular disease. Being a good source of potassium, blackberries also regulates your blood pressure effectively. Magnesium in blackberries also improves your insulin response, hence reduces insulin resistance. Is blackberry suitable for weight loss? Blackberries are low in calories (34 calories), high in fiber and other nutrients, thus you can have an extra serving of blackberries without the risk of adding on extra weight. Blackberries are extremely rich in antioxidants putting them on top of the list to be used in weight loss plan. Antioxidants ultimately reduces the inflammation by scavenging free radicals. Presence of free radicals is the cause of inflammation and thus weight gain. Include more of antioxidant rich fruits and vegetables in your diet to getter better results. Additionally, fiber (1/2 cup of blackberries provide 4.2 grams) also plays an important role because it aids in slow digestion of nutrients, thus makes you feel full for a longer period of time. And yes will control your appetite overall. Include handful of berries such as blackberries or any other berries in between meals in place of calorie laden snacks.